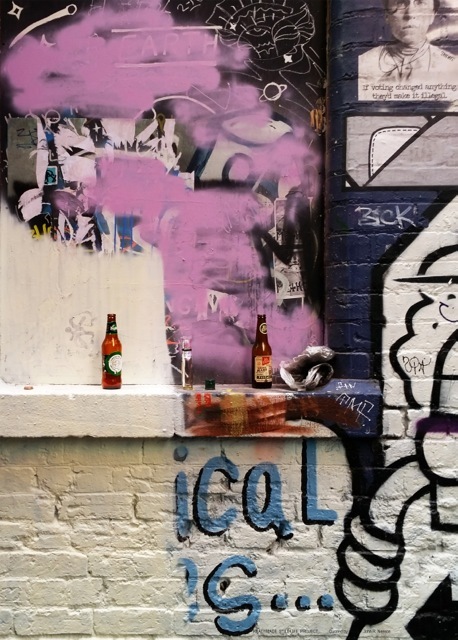 Melbourne Readymade Still Life is a paste up poster project that temporarily introduces images of found objects into the mix of the city’s renowned street art culture. their creation or provoke speculation on the circumstances that lead to their being there. Consequently, the Readymade Still Life becomes evidence of the events and interactions that continually give life to the city, much as artifacts uncovered by archaeologists do for past civilisations. Neeson considers himself the curator of these unsigned transitory vignettes of city life and uses the simple poster to bring them to the attention of the public in Russell Street (next to Forum), Duckboard Place, AC/DC Lane, Little Bourke/Elizabeth bollard, Little Bourke/Swanston bollard and Queen St/Bourke St.
Melbourne Readymade Still Life is a development of his previous projects on streets in Berlin and Collingwood, which was also included in the 2016 Oslo Flaneur Festival.